This will be the 35th competitive fixture between the two clubs, with neither side ahead on a head-to-head record with 13 wins apiece alongside eight draws. Cardiff ran out 2-1 victors at Molineux back in August as goals from Joe Ralls and Nathaniel Mendez-Laing gave Neil Warnock’s side victory. 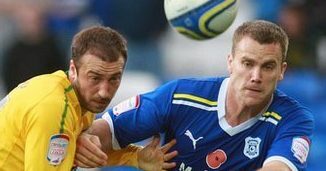 Indeed, the Bluebirds have held the upper hand in this fixture’s recent history with four victories in the last five encounters. Cardiff won the meeting in the Welsh capital last season by a 2-1 score line. Nuno Espirito Santo’s side’s three-game winning streak was ended on Tuesday but they were boosted by a late equaliser at home to struggling Hull City, in a game which finished 2-2. This is a meeting between the division’s best home record and its strongest away record: Cardiff have won 48 points from their 20 home games, with Wolves picking up 40 points in their 20 matches on the road. Cardiff are unbeaten in their last 11 matches – a run which was preserved with Monday night’s 1-1 draw at Sheffield United, where Anthony Pilkington scored a last-minute equaliser for the Bluebirds. Neil Warnock’s side had won each of their previous eight league matches and are the Championship’s form side. Cardiff are expected to continue to deploy their 4-3-3 line-up which is headed by Kenneth Zohore and flanked by Junior Hoilett and Nathaniel Mendez-Laing, although Anthony Pilkington will be pushing for a start after his goal at Sheffield United. Wolves will continue with their 3-4-3 line-up which is headed by Diogo Jota and flanked by Helder Costa and Ivan Cavaleiro, although Leo Bonatini is hopeful of a starting role having both been dropped for the clashes with Middlesbrough and Hull. Full-back Matt Doherty and central midfielder Ruben Neves are both available after suspensions. This is arguably the biggest game of the Championship season to date, although both clubs will be confident of automatic promotion to the top flight regardless of the result. Both side’s respective winning streaks came to an end over Easter but both go into this game with a certain level of momentum following late equalisers in each game. Home advantage and a longer sustained run of strong form puts Neil Warnock’s Cardiff as slight favourites for this encounter against Wolves, whose performances and results have been more unpredictable of late. Each of the Bluebirds last five games have seen goals go in at both ends while for Wolves this has been the case in four of their last five games – with 19 goals going in across this spell. Unbelievable Jeff! Cardiff miss not one but TWO penalties in stoppage time to deny us a winning BTTS bet!